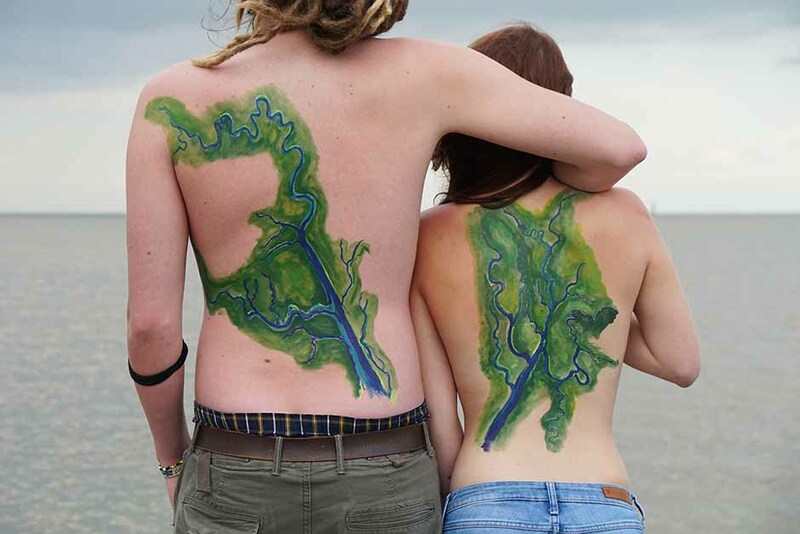 City as Living Laboratory is participating this weekend in Car Free Earth Day by putting on our first Estuary Tattoos event with artist Bob Braine. All the way from Times Square to 14th Street, Broadway will be closed to traffic. Environmental programming offered by City agencies and nonprofit organizations along the route will promote activism and education surrounding climate change, sustainability and other relevant topics. CALL's contribution will be the first in a series of events this summer and fall to raise awareness about the possibilities presented by daylighting Tibbett's Brook in the Bronx. Bob Braine will be painting depictions of the estuary as it once was, is now and could become on the bodies of participating passers-by. We'll be joined by Steve Duncan- expert in all things under New York City- who will be answering questions and providing insight on Tibbetts Brook, New York City's Combined Sewers and daylighting. Come join in the fun and help us raise awareness about daylighting- an initiative that will have a huge impact on the future sustainability of New York City. You'll find us at Herald Square!